Zakk Fairley Video Production on Vimeo. Production groups formed by creative young people will take center stage and screen this evening at the Normal Theater, 209 North St., Normal, IL, during a “Local Filmmakers’ Showcase” that will begin at 7 p.m. The headliner is a 40-minute featurette from Vigilant Studios of Normal called BLACK BOOK that is directed by Zakk Fairley and written by Ricky Punjabi, two of the group’s cofounders. Adam J. Rebora, Anastasia Ferguson, and Wes Melton star in a thriller about an engaged couple stressed by their move to the big city as well as opposite work schedules, keeping them separate on most days. As a spur-of-the-moment idea, Elisabeth (Ferguson) visits an antiquarian bookseller (Melton) to purchase a birthday gift for Skylar (Rebora), ultimately taking home an ancient Latin-language book that Skylar can translate thanks to his college studies. They receive no thanks, however, from the mysterious forces awakened by reading this cursed volume! Whereas most cast and crew of BLACK BOOK are Illinois State University students and recent alumni, we have to take the educated guess that lead-in drama AWAKE is the handiwork of an all-ISU crew since we can’t find any hard information about it other than the plot crunch provided by the Normal’s Facebook page. “AWAKE is a coming-of-age artistic exploration into the lives of a group of college juniors and seniors,” states the Event listing about the 70-minute-long story, “[and] takes realism and combines it with surrealism into one piece of art to take the audience into the dreams, nightmares, and the realities of being a young adult in today’s society.” Sounds like a pretty heavy-duty experience is in store for the audience, yes? We’re also presuming the show serves as a public premiere for AWAKE; BLACK BOOK received its own unveiling last Saturday, April 29, also at the Normal. Tonight’s showcase is free to attend and will conclude with a filmmaker question-and-answer session, while you can find links to additional BLACK BOOK coverage in Bloomington-Normal media on the Vigilant Web site. p.s. 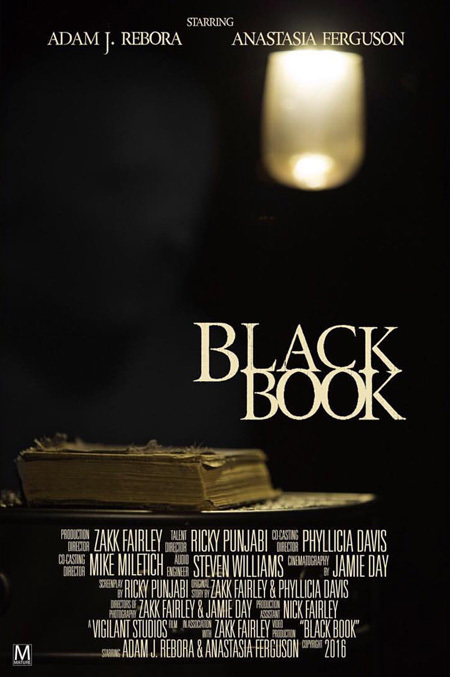 Unbeknownst to us at posting time, the filmmakers had planned to release BLACK BOOK on Vimeo immediately after these shows. Hit the link and check out the short in its entirety! This entry was posted on Wednesday, May 3rd, 2017 at 12:30 pm	and is filed under Alums Done Good, Public Events, Student Film, Videos du C-U. You can follow any responses to this entry through the RSS 2.0 feed. Both comments and pings are currently closed. 14 distant relations of Jan Tschichold dissected this page in 0.374 seconds while exacting sweet revenge in silence. © C-U Blogfidential. Powered by WordPress 4.9.10 & probably invalid XHTML and CSS. Syndicate: Entries (RSS) and Comments (RSS). Crisp & Clean: Designed by fernando_graphicos Based wholely upon Kubrick code.